As you probably know, there is so much that goes into wedding planning. In the process of planning a wedding, decisiveness is a virtue. There are the big decisions, like choosing your venue or creating your guest list, and there are the small decisions, like choosing your wedding favors. 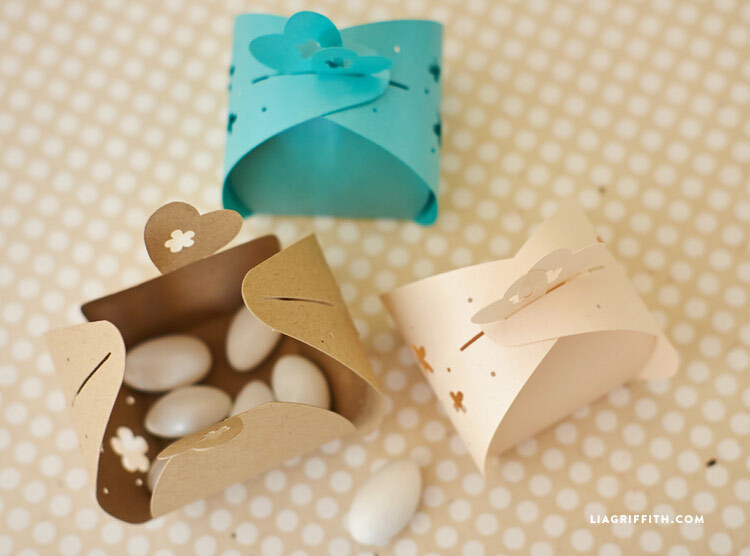 Luckily, if you have some pretty paper and some Jordan almonds, you have everything that you need to make your own pretty wedding favor boxes for all of your guests! These wedding favor boxes are so simple, yet so adorable. Download the SVG file below if you will be using a cutting machine to create the cute papercut flowers. Cut these boxes onto text weight metallic paper or card stock. 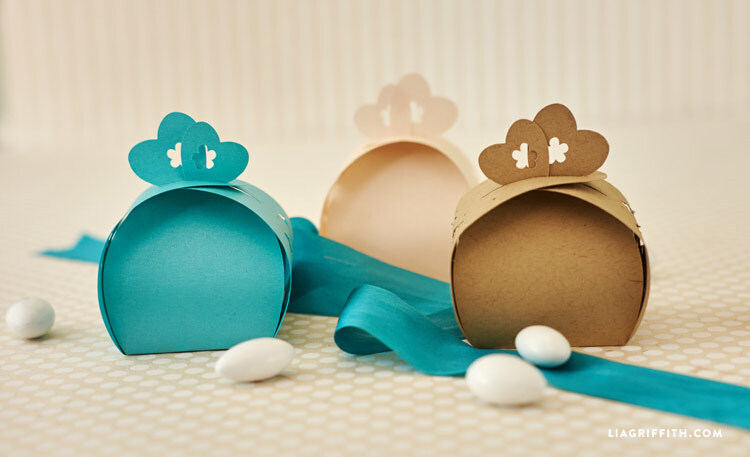 Fold the flaps together, stick some cute candies or trinkets inside, and there you have it! Jordan almonds are a traditional wedding favor, but feel free to get creative with your favors. If you will be cutting by hand, we have also added a PDF version available to download. 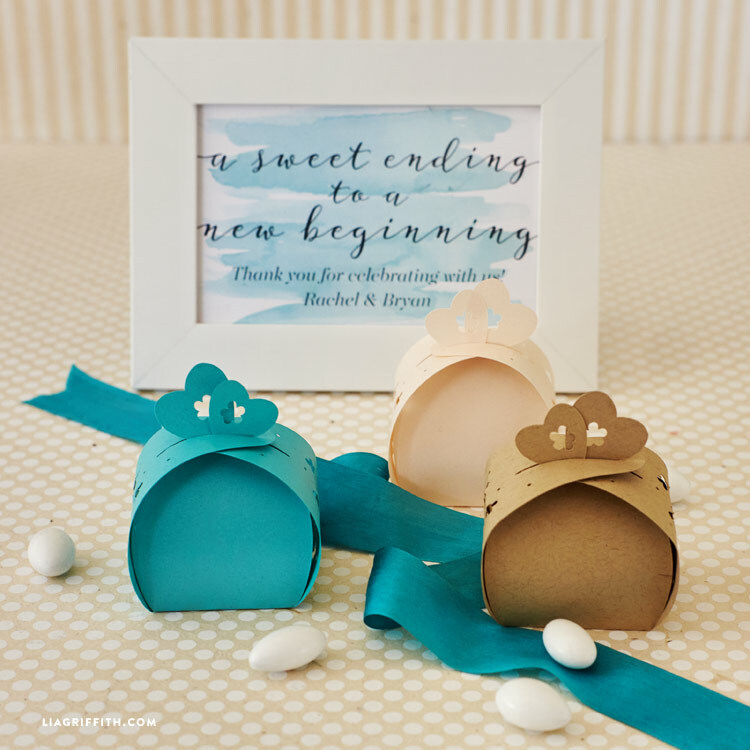 The PDF version includes wedding favor boxes in white, kraft, and mint colors. You can use the white file to print onto any color of paper that you would like to complement your wedding’s color scheme. Or, print the kraft or mint versions onto white text weight paper or card stock. To cut the slits for the PDF version of the wedding favor boxes, I would recommend using an x-acto knife. When you have folded your boxes together, there are so many options for incorporating them into your reception. You can place one at each table setting, or you can create a separate wedding favors table for guests to grab their wedding favor boxes at the end of the evening. I love the idea of attaching place cards to them with ribbon informing guests which table they will be sitting at during the reception. So cute! Oh my gosh Lia, these are too adorable and so perfect for a wedding. I see my Cricut being used – if were going to make them. Wondering if son and fiancé would like these for their wedding in June. We will be attending, can hardly wait. Their wedding will be in their back yard and kept very simple to avoid too much or any stress for them. Think maybe should give son a call to see what they think about it . Could be our gift to them. Will peruse other wedding ideas to if anything else could do. Now am more excited than ever. First have to figure out how to use new fancy phone, scares me. Hubs thought he’d surprise me with gift of new phone, if I can ever figure out/remember how to even make a call. Anyway will give your wedding section a good survey, see if something might do for them besides favor boxes.